I finally managed to visit the land of batuan, that legendary souring agent Ilonggos use in soups, stews, etc. I had only come across batuan in a bottled form before, but have heard so many good things about it. A relative of mangosteen, it has a definite sour note, but it has a more complex taste rather than just being acidic. 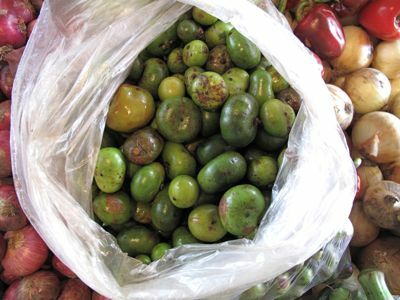 Dishes that include batuan are mildly sour but also possess a wonderful and characteristic fragrance. I’ve never heard of batuan before. Could it be eaten raw with salt like green mango? Thanks. I learn so much from your site and makes me feel homesick each time I read and see pictures that makes me want to go back to Manila. San Francisco is not so bad, got a lot of asian food stores and best Chinatown but nothing compares to the wet markets and places you visit. Sigh! Hi MM! Try this in your lechon. I know they use this in Bacolod. And you can really taste the difference. Along with loads of tanglad, sampalok and sampalok leaves. And remember KBL? This is perfect for that one, too. And kansi, our local version of bulalo. Nice blog. Looking at it makes me hungry and homesick at the same time too. I say it is one of Mother Natureâ€™s blessings to the people of Negros for a good produce that is so versatile. From what I heard they never grow outside of Negros regardless you retained the service of an horticultural expert with green thumbs, etc. It is only in Negros they thrive. I was told that it is also good in sauteed guinamos and some folks over there is their everyday stuff with rice. It brings guinamos to higher tier not to mention inasal, their nilaga version, sinigang and KBL. I was also told that they make good jam out them. The ilonggos usually preserve the batuan by brining it, you know put in a jar with salt and usually some garlic the way you brine kamias. Wait for a few days until it change color, yummy. MariaClara, I grew up in Iloilo and we have always had batuan. ntgerald: good to know it thrives well in your area. I was only told so it is not my first-hand knowledge and everyone says inasal either chicken, pork or what have you is not the same as the one with batuan. Maria Clara,I see batuan sometimes in the bagsakan market in Puerto Princesa. I was toid they are souring agents but didn’t know how to use them, I shall try them with meat sinigang and see what happens. I wonder if they grow them here in Palawan or shipped from Bacolod or Iloilo? I’ll find out. Our suki lechonero in Bacolod puts that in his lechons and whenever my dad gives these lechons as gifts, he is usually asked where he gets them :) For a number of years we have had to send these lechons on PAL flights to people in Manila who love them! Pandora, when we were kids, we would cut up Batuan and nibble it with sea salt–it has big seeds, though, but oh so SOUR!!! Batuan has been a consistent souring agent in sour broths in Western Visayas. This is DEFINITELY NOT exclusive to Negros only. The flavor is very different from sampalok or kamias . I am sure they will grown elsewhere in the Philippines as long as people will plant them. Problem is not too many people are aware of their existence and know how to use them. Look as “alugbati”. This was common among ilongos until a few Manila folk learned to use them. It is still not a common vegetable here though. This is the same with the inner core of the banana trunk called “ubad” which is used as a vegetable and often combined with “kadios” still a rarity in Manila. Thanks for the valued photos, MM as well as the comments of the Ilonggos here! I was wondering about the look of the batuan fruit and here it is! Maria Clara, we also grow batuan in Leyte. We grew up pairing this with salt like green mango. yup. try batuan and tanglad and tamarind leaves as stuffing in your lechon MM. nice. i think that’s how the lechonero’s in the lechonan country [used to be along the Araneta highway in front of the ice plant in Bacolod] do it. Wow, I never knew Bacolod has such rich and varied cuisine! Ley, where in Leyte? I’m dying to try this fruit! and the good thing about batuan is that it is really inexpensive. Five pesos will give you a handful depending on the size of the vendor’s hand so do not buy from a child, buy from a giant. Actually a lot of the stuff in the markets like batuan, kamatis, onions are sold by “atado” or little bunches or handfuls or mini mountains. Who decides how much in a bunch? Is it the hand of the market deities that guide them? Ley, I’m also from Leyte, and I remember batuan as a readily available ingredient in the local market when I was growing up. I remember it being used in sinigang or tinola as a souring agent. I always assumed it was a local product even though I never saw it being grown in vegetable gardens or farms in the area. lee, I actually like that method of selling, it is SO charming. I also hear batuan grows in Bohol, but few folks cook with it. I always dread the time when Iâ€™m going back to Manila during short trips to my hometown in Negros. Relatives would always send batuan for my mom! Itâ€™s like carrying a bag of stones! My mom usually pickles batuan—she puts them in a glass jar with water & salt. It lasts for monthsâ€¦so you can just imagine how many dishes with batuan my mom prepares. 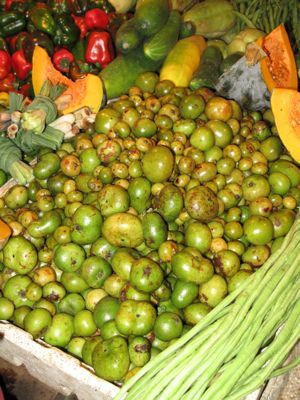 Iâ€™ve never seen a batuan tree but my sister in-law, who is from aklan, said they have one in their backyard and they didnâ€™t know itâ€™s edible until my mom visited a few years ago. Mom brought back 10 kilos of fresh Batuan from her recent trip to Silay, Negros Occidental. Half of it we pickled by putting them in jars with salt. hahah, i can sympathize. that happens to me to. maiwan na lahat, wag lang ang batuan ni Manang [our kasambahay]. Did you bring home some batwan? I got to thinking this might go into one of your jam/ marmalade experiments. MM.. just curious.. have you been to mindanao yet? hi. am from aklan and indeed there are a few batuan trees in our farm. some use it as souring ingredient in kinilaw na dilis but otherwise it’s not widely used. my boss, who is a full-blooded batangueno, always asks me to bring back a few kilos every time i go home. he pickles the batuan himself and enjoys it as a relish. he acquired the taste from his wife who is from guimaras. there must be a story about the diffusion of people’s taste for food somewhere there. Can anyone please describe the batuan tree? I am wondering whether this is the same tree I saw in Jakarta with red and green round fruits (although bigger than the batuan pictured above). The fruits, like in the kamias tree can be found amongst the leaves and even on the main trunk. The Indonesians I asked didn’t know the name of the tree either, and they said they didn’t think the fruits were edible. However, one said that it had some kind of medicinal properties. Indonesians have some kind of sour soup although I forgot to ask what they used for souring. marissewalangkaparis, I don’t claim that alugbati is just Ilongo but it definitely is a Visayan staple in the “laswa” (boiled vegetables). I am sure other neighboring provinces use them. It is supposed to be very healthy and remember having it in the dinner table all the time. I actually see it being sold in Chinatown in bundles these days. It still seems to be a regional ingredient though. With the number of Ilongos and Visayans in Metro Manila it is is not surprise it is more available. I actually see Kadios being sold by only one person in Divisoria. The vendor peels them in front of my eyes. There must be a plantation nearby.Hopefully batuan will eventually make its way to Metro Manila markets with more people aware of it. nangangasim ako sa batuan na yan though i havent seen and tried it…im thinking of going to bacolod and i dont know anybody from there, just to try that souring agent and see all the places you’ve been MM… thanks for the post. 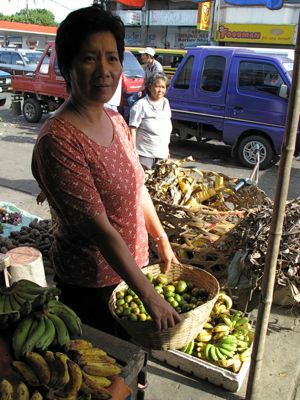 I am also from Leyte and we get to find batuan in the market although I think they’re seasonal. Haven’t seen a tree though, would love to find a photo of it in this site someday soon. I have also no idea how batuan taste I just came to know about it when I read about it as a secret ingredient on inasal. I need to ask my sis to buy batuan bottle for me at tiendesitas if they still have it there. heard of this negrosanon riddle/ joke? There are many fruits in the forest, but one is the best. Which fruit do you think is it?……. Damn right its the mighty little batwan. Makes our sinigang, KBL, pinamalhan, kansi, and lechon… namit! I see this Batuan, bottled, and meant as a souring agent. You may find it at the store of ECJ Farms, Tiendasitas. hi. we just arrived from bacolod and we were able to taste the “kansi” served to us at a restaurant. we were told that the secret to this delicious kansi are the batuan seeds. unfortunatley, we were not able to buy them when we were in bacolod. Cherry, I have never seen fresh batuan for sale in Manila. There is a bottled version from ECJ Farms that is sometimes available at Tiendesitas Mall. Jasmin, if in Negros, it means Kadios, Baboy at Langka. If in Ilocos, it stands for Kamatis, Bagoong at Lasona, or of course, if you are a Marcos follower, the name of this political party. good afternoon…i wrote a few weeks ago asking where to buy batuan seeds for the kansi. fortunately, a friend of mine just arrived from bacolod and was able to bring some fresh batuan seeds. now, i would like to know how these seeds are cooked to make the sumptuous kansi. hope i could get an instant reply. thank you very much and more power!!!! I was at the AAni Weekend market in Taguig last week to buy fruit trees and the tree vendor offered me a Libas tree which use for paasim like kamias. Since Iam not familiar with the tree,I declined to buy it. Now, I wonder if this is the batwan or batuan being discussed here. I saw the photos here and Iam going back to AAni to ask the tree vendor for more info about his libas tree, hopefully, its the batwan. seedlings are sold by nurseries in bacolod. Leaves are also used to stuff chicken and lechon…..it gives a sour note…and the gravy from a roast Batuan leaves stuffed chicken is really very good. Hi there! for the fast few months I have been craving for the kansi i tasted in one of the Ilongo restaurant here in manila. I got curious about the ingredient and did some research about it. Luckily i have found this very helpful website. I got so addicted to the taste and wonder where I could buy these batwan stuff? I hope someone could help me. Please. saan pdng makakita nyan d2 s manila????? hmmm perte ka namit bah!!! namis ko tuloy ung mga luto sa amin sa bacolod. iba tlaga ung lasa ng batwan, perfect yan sa linagang baka, and ung KBL. hmmmm sarap as in…..
what are the chemical content and properties of batuan fruit? where can we find this fruit here in manila or somewhere in south?. thanks for info. Hey everyone. I was born and raised in Iloilo with Lina-ga (what most know as Kansi), KBL (Kadios, Baboy, Langka), and Monggo with Alogbati as some of my most favorites of viands. My brother and I ate these literally everyday without getting tired of them… especially Emirose’s Lina-ga.
Now living in Manila, I get so homesick that I find myself craving for these. From my last trip home, I brought back Kadios and Batuan and tried to cultivate them. I was able to successfully grow Kadios, the Ilonggo black beans in KBL, which have now become like a pet to me. On the other hand, I found Batuan to be much more difficult to grow from seeds. I tried looking for seedlings at the Manila Seedling Bank but they don’t have any… except for it’s cousin, the mangosteen. If anyone knows where I can find seedlings in Manila, please let me know right away. Alogbati is so ridiculously easy to grow and yet very nutritious that I wonder why hardly anyone grows them here in Manila. After removing the leaves off it’s stem, just soak one end in water overnight and plant (even in a pot) the next day, with pegs. Soon enough you’ll have a fresh batch. Lina-ga, or Kansi, is made from the part of the beef they call Kantaw in Iloilo. They said it to be taken from the shoulder area but I’m not too sure about that. The meet is so tender and with bits of delicious-tasting fat (and I’m not very fond of fat). The closest taste to ours that I found here was at a roadside karinderia-type restaurant en-route to Tanay, Rizal. Along Visayas Avenue, there’s also Pat-pat’s… a truly Ilonggo restaurant that specializes on Kansi. However, despite having Ilonggo staff, they were unable to duplicate the real flavor here. I still prefer Emirose’s over theirs, anyway. Plus, they don’t serve beer or Mountain Dew… a mortal sin. Sorry, Pat-pat. from bacolod city, yes batuan is the best especially with KBL (kadyos nangka and baboy)Through hi tech of propagation, we’re growing batuan as an ornamental fruit tree, coz we do graft it and as tall as 2 feet it bears fruit whole year round. I have one potted batuan tree multi grafted and it provides my family with fruits anytime we need it for cooking. Even my one year old grandson can harvest it. I always bring Batuan back from vacation, 2 to 3 kilos at a time. We are even growing it here in my back yard (was able to bring a seedling) about 3 1/2 ft. high now. I can’t wait for that time that we can just pick a fresh Batuan from our tree when needed. Even our 3 kids, (all born in US) know Batuan and really like it. I think Batuan only grows in Western Visayas because all my friends here in US that originally came from other region in PI are not familiar with Batuan. Evelyn, how do you go about grafting it? And how are you able to grow it from seed? I tried unsuccessfully. I am looking for katuray, kadios and batuan seedlings or grafts but don’t know how and where to obtain them. I am from Zamboanga City. Anyone here, please, who can give me information? Back in the province my mom always use batuan whenever she cooks nilaga. I just don’t know why we don’t have batuan here in manila? whenever i’m in the province i always ask our helper to buy batuan for me so i could bring it back to manila. I loved the taste and the aroma of batuan that is why i always use it everytime i cook nilaga and paksiw na isda. If i no longer have a stock of batuan i replace it with kamias instead. we grew up in batangas. my cousins from aklan used to tell me about how good using the batuan than the kamias in sinigang. this is the first time i’ve seen the pictures of batuan.